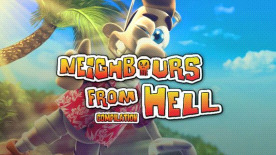 The Neighbour from Hell wants to enjoy an undeserved holiday – reason enough for Woody and the camera team to sneak along onto the cruise liner to make the nasty neighbour's holiday a living hell. This time, the neighbour's mum has joined him, and she is taking good care of her baby. © 2013 by Nordic Games Licensing AB, Sweden. Licensed exclusively to Nordic Games GmbH, Austria. Published by Nordic Games GmbH, Austria. Developed by JoWooD Vienna. The JoWooD design and mark are registered trademarks of Nordic Games Licensing AB. All other brands, product names and logos are trademarks or registered trademarks of their respective owners.